Below 50 metric tons cranes are growing in popularity and are utilized across various applications, which include construction, mining, oil & gas, and energy, driving the crawler crane market. 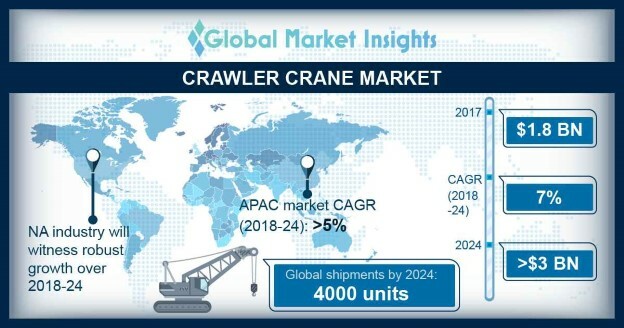 In the U.S., the market for crawler cranes below 50 metric tons is expected to grow at 6% CAGR from 2018 to 2024. For users requiring both internal and external lifting solutions to be operated in limited & restricted work areas, these cranes are an ideal option. Previously, many high-capacity cranes were used for small lifting purposes. With the usage of such low-capacity machinery, customers can save money and time by avoiding the use of higher capacity solutions or renting expensive cranes. These machines are easy to ship and transport, offer a narrow-aisle, operator-controlled crane making it easier to perform operations such as roof work and glass installations. The construction application segment in China dominated the industry with a market share of around 40% in 2017. Construction applications offer a huge impetus for growth in the market. The global construction spending registered USD 7.2 trillion in 2013 and is anticipated to reach USD 15.9 trillion by 2024. Increasing construction spending is a major factor escalating the crawler crane market growth. Rising government focus toward infrastructure development projects along with the consumer preference for luxurious & aesthetic constructions fuels the market demand. Growing necessity for houses and high investment requirements, such as smart city projects & high construction spending, in economically stable countries are expected to contribute to the industry demand.